Irishman Declan Burke has made his name with some very fine comic crime novels that have a sense of fun, even zaniness, amongst the murder and mayhem. His latest effort is quite a departure - more of a classic mystery with a few thrills, where a twist-filled plot with its roots in decades past unfolds as the pages whir. While some readers may miss the humour usually present in Burke’s crime novels, he demonstrates a deft hand for the change in pace. Journalist Tom Noone is scraping together a living but needs an influx of money to keep his beloved daughter Emily in his life. As the financial crisis looms, he's offered a bizarre ghostwriting commission by elderly mining magnate Shay Govern. Shay's looking to return home after making his fortune abroad, and wants Tom to research and write the life story of Sebastien Devereaux, a forgotten English thriller writer who lived a reclusive life on the island of Delphi. Tom will work with Devereaux’s daughter, who seems to have also convinced Shay to invest big money to prospect for gold on Delphi. Is the old man lovestruck? Tom can sense that there's much more going on, but he's desperate for the money. When witness accounts of a long-hidden Nazi atrocity on the island emerge, and then a body is discovered in the canal and a mysterious policewoman starts to turn up the heat, Tom realises his choices might not only have threatened his own integrity, but put his and his daughter's lives in grave danger. Someone seems to want to stop him – but from doing what? Investigating the claims? Writing a book? Burke creates a great narrative drive right from the start, hooking the reader into an "I want to know what happens" vibe which powers the early part of the story as Tom - an intriguing more than gripping character - investigates what is going on. The pages whir easily, even though a lot of what happens is discussion and accounts of events, rather than action or the events themselves. I found myself wondering how everything would fit together - there's almost an old-fashioned puzzle-esque murder mystery vibe or feel to this contemporary thriller. As Tom heads to Delphi the action picks up, as does the revelations from the past. 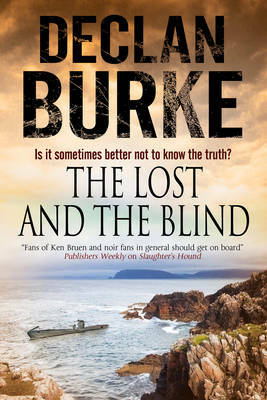 Burke nicely balances red herrings and clues, twisting things around in surprising ways at times. There are layers upon layers to the deceptions in the story - the characters deceiving each others, and in some cases themselves. There are also some interesting themes about the ways in which people take advantage of tragedies, and justify their own actions and choices to themselves - however monstrous they may seem to others. A novel about the past, about stories created and real, and about how some people search for redemption while others never think they need it. THE LOST AND THE BLIND is intriguing and interesting. A good read.